In 38 Task Force, the mantra of the 38 Tax Collection Division, a government unit in charge of collecting taxes, is — “Trace to the end, must be collected”. Yet while the working class diligently pays their taxes, the wealthy elites are living outside of the law and keeping all the money to themselves with the help of their intricate web of power cahoots. 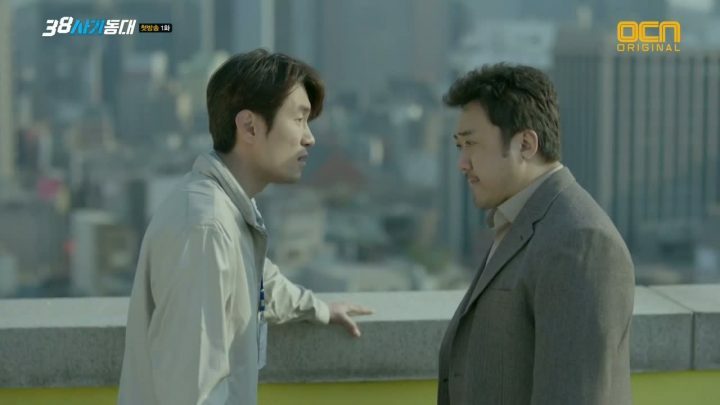 That is, until the gangster-looking yet righteous Baek Sung Il (Ma Dong Seok), National Tax Service Division 3’s chief, decides to join hands with a young slick-tongued conman named Yang Jeong Do (Seo In Guk), to go after them. 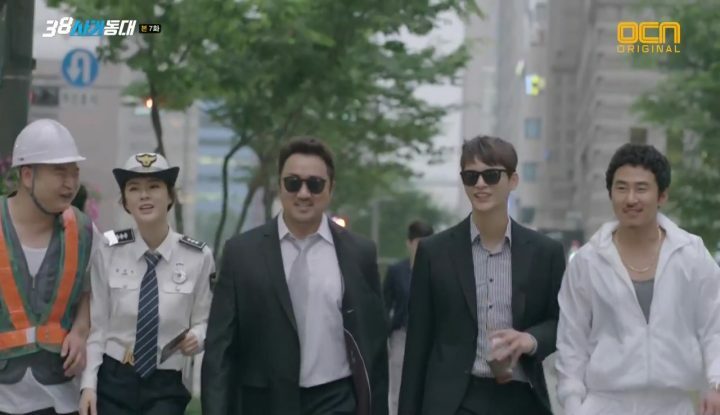 Together, they assemble a team of professional scammers — voice phising expert “cannon” Jang Hak Joo (Heo Jae Ho), computer expert Jung Ja Wang (Ko Kyu Pil) known as “keyboard”, “flower snake” Jo Mi Joo (Lee Sun Bin), and ruthless businesswoman “wallet” Noh Bang Sil (Song Ok Sook) and her daugher Choi Ji Yeon (Kim Joo Ri) — to cheat money from three of the most delinquent targets — business man Ma Jin Seok, his boss Bang Pil Gyu, and his boss’s boss Choi Cheol Woo. Similar to the Oceans 11 movie series, 38 Task Force executes a fairly predictable storyline format: recruit a team, identify a target, make a scheme, execute flawlessly, then move onto the next target and repeat the same steps. However, unlike the movies, the drama’s long-form storytelling medium allows for a more complex setup of the characters’ backstories and motivations — a benefit I particularly appreciated when it comes to our two heroes, each with their own buried reasons for punishing the law-breakers. 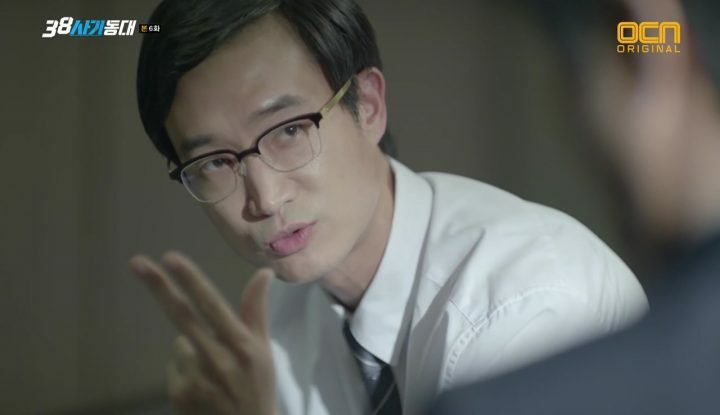 For Sung Il, of course he’s driven by the pressure from his department and his natural sense of justice. But more importantly, he has a strong desire to finish his brother-in-law’s mission, and give purpose to his death after failing to collect taxes from the corrupt trio six years ago. 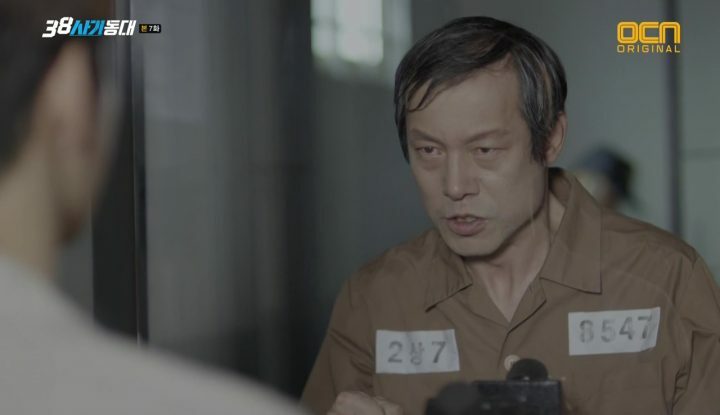 For Jeong Do, he’s here with a secret motive to avenge something that no one saw coming initially, as he hid his true intentions from Sung Il, his team, and the viewers alike. This made for a great twist in the story and created conflicts and doubts between characters at the right times. 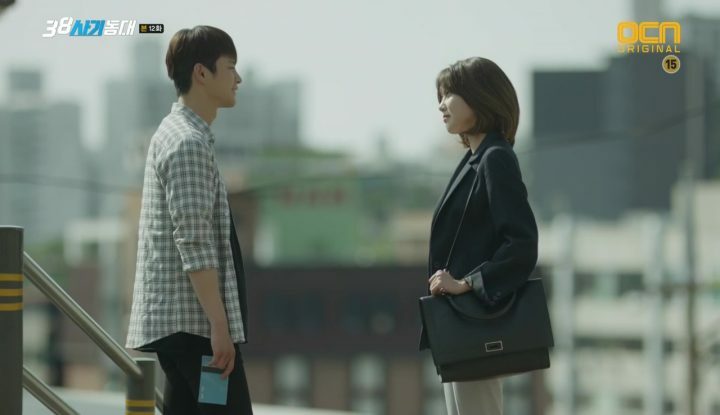 The drama planned its character interactions and scams especially well. Add on top the smart dialogue, nuanced acting, clever schemes, and charming team chemistry, you’re completely bought into this group of relatable characters teaching bad guys a lesson in a seemingly realistic way. Even more impressive is the fact that the con jobs get more elaborate with each target, with real and fake betrayals that keep you guessing on. There’s no doubt that 38 Task Force planned its character interactions and scams especially well. However, while the drama’s 60 minute episodes definitely provide a canvas for deeper character development, they’re also a double-edged sword. Longer episodes also mean more screen time to fill, and 38 Task Force unfortunately failed to put those extra minutes to good use. First off, it took four episodes just to set up the premise and assemble the team, making for a rather painful slice of life segment to sit through with the most thrilling moments being Jeong Do’s speed driving. What’s worse is that the same humdrum period always inevitably appears right after the team is finished with a target. The drama turns into a crawl waiting for our heroes to make up their minds about if and how they’ll work together again for the next target, even though we all know too well that they’ll definitely partner up again. The humdrum period inevitably appears right after they’re done with a target. If watching Sung Il running around purposelessly like a headless chicken without Jeong Do is not enough to bore you, we’ve also got the wonderfully useless addition of the female lead (if you can even call her that) Cheon Sung Hee (Choi Soo Young). She’s an upright and caring woman that works for Sung Il, who also happens to be burned by Jeong Do in the love department years ago. 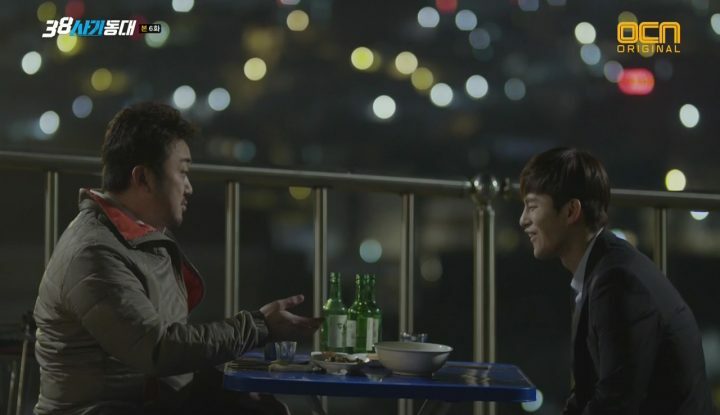 Sung Hee’s character is damned from the beginning, with her role trivialized to an overly naggy yet ineffective hindrance to Sung Il and Jeong Do teaming up at first. Then, when the inevitable collaboration takes place anyway, Sung Hee resorts to a minor conduit of information between characters. She’s sometimes nosy and sometimes counterproductive, but always with good intentions and always making unnecessary appearances at the wrong times. 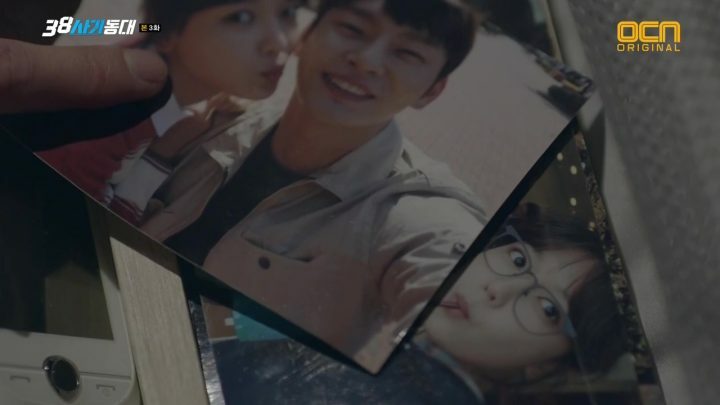 Even supporting characters like the shady police officer and conniving head of National Tax Service Division have contributed more to the plot than Sung Hee has. 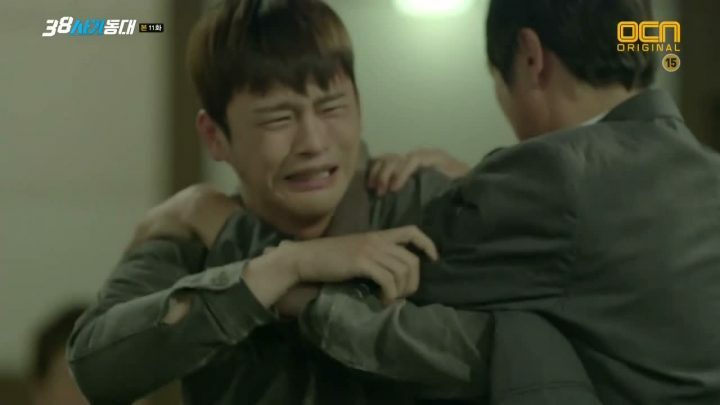 It’s such a shame and a waste of Sooyoung’s natural acting. 38 Task Force did hint at a misunderstanding between Jeong Do and Sung Hee, and teased the possibilities of the two getting back together, but unfortunately did not commit. Had it spent more time developing the emotional stories between them, that might have been a better use of the screen time, though arguably less genuine to the nature of a character who’s so busy conning people and so keen on his revenge scheme. In either case, it’s a tough sell, so perhaps the drama would be better without Sung Hee altogether, as the storyline would hardly change anyway. 38 Task Force is indeed a polarizing drama. If you can sit through the valleys of the plot, the hills are indeed ingenious, intense, entertaining, and full of unexpected twists. At the very least, I’m sure you’ll end up liking the team of crafty thieves and their overflowing chemistry.